Stake a claim on outdoor whimsy with a wind-surfing stake that gently sways in the breeze. 26" W x 3" D; 3 lbs. 8 oz. ; 45" H staked. Wipe clean with a soft cloth. If left to oxidize naturally, the surface will turn to a pleasant rusty patina. To help retain existing finish, apply a clear, exterior-grade polyurethane sealant. Allow to completely dry before exposing to moisture or sunlight. Item includes one balancing stake and 3 owl sculptures. Looks cute outside window in garden. I put this in my flower bed. It's so unique, I haven't seen anything like it anywhere else. I have gotten multiple commments on it already! I have this in a flower pot on my front porch. Adds whimsy. Love it! 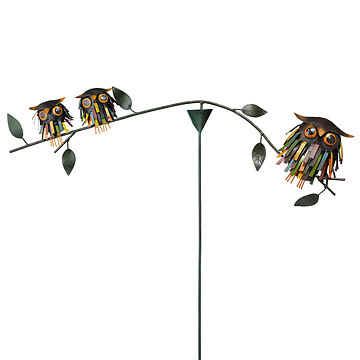 Was looking for a conversation piece for the patio area and decided to take a chance and order two the owls. So glad I did, WOW, they are absolutely fantastic. Well constructed and extremely attractive. Definitely a great addition to my patio area. Your Customer service person made all the difference!! I love your company because of how helpful she was!! I hope she is rewarded, I will order again because of her service!! Your merchandise is GREAT too!! I told my mom it represented her and her two grandkids. She loved it! Well made and very attractive! I fell in love with it when I saw it in the catalog. I have it hung in our hallway above the door and it looks great. Don't know if it will make it outside.